If you’re willing to pay more for the convenience of a cordless finish nailer, go for it. The best cordless finish nailers now have enough power to match good pneumatic finish nailers, and enough battery life to do even heavy-duty jobs. They offer the freedom to embark on a project without the hassle of using gas, compressor, and hose. They are very lightweight and can easily fit into your toolbox, so you can take them with you anywhere without any inconvenience. We understand the benefits of owning a cordless finish nailer and we also understand it’s not easy for you to choose the right one that best suited to your needs and your budget. There are so many choices out there, most look similar. Because of that, we decided to spend over 20 hours reviewing several excellent models that we feel are worth your money. What do you expect from your new cordless finish nailer? A power of corded, ergonomic design, or the longest battery life? This DEWALT DCN660D1 20V 16-Gauge Angled Finish Nailer will provide you all of those things and even more without breaking the bank. We’ve found that this finish nailer is more robust and more versatile than most other cordless models. It works very well on hardwood, too. We believe that this is the best cordless finish nailer you can buy at this time. The DeWALT DCN660D1 comes as a kit, consisting of a durable case, diagnostic battery charger, and one 20V MAX 2.0 Ah battery. An adjustable belt hook is integrated onto the base. You can, of course, use it with any of the standard flat bottom mount batteries. If you already own a bevy of cordless DeWALT tools and have ample batteries, you may want to purchase the bare tool, the Dewalt DCN660B. The key feature of this cordless finish nailer is its brushless motor. This feature helps reduce significantly overall tool weight and gives better battery mileage, and should provide a longer tool life. Dewalt’s brushless motors require less energy to run the motor and also less friction, heat and amp draw. All of those mean a longer run time. According to Dewalt, their brushless motors can deliver up to 57% more runtime over other brushed motors. We think that this is probably the thing that makes many Dewalt’s cordless tools, such as cordless impact wrenches or cordless air compressors, the top-of-the-line products on the market. At just 6 pounds (with a battery installed), the DCN660 is lighter than most other models that we’ve reviewed. But it’s still about 2 pounds heavier than a typical 16-gauge pneumatic nailer. Most of the weight is in the head – where its brushless motor is located. 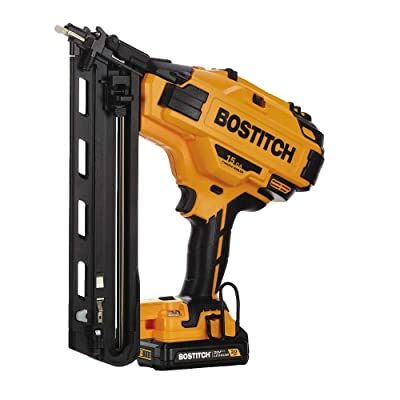 Fortunately, it’s quite well balanced and doesn’t feel overly hefty or cumbersome in use, an important consideration if you’re using the nailer for any length of time or doing a lot of overhead work. One of the best parts of this best cordless finish nailer, as most Dewalt’s cordless power tools, is the DEWALT 20-Volt MAX batteries. Dewalt MAX batteries are always the best on the market, you can’t go wrong with them. According to DeWALT, with one 20V MAX 2.0 Ah battery, you can expect to sink about 800 nails per charge, though the actual number will depend on the type of material you’re nailing into. That is a decent number, but if you want more runtime from the nailer, you can get a 4.0 Ah battery. All in all, we can’t find any problem with this cordless finish nailer, it’s well thought, well designed, and performs like a pro. We love it and highly recommend it. 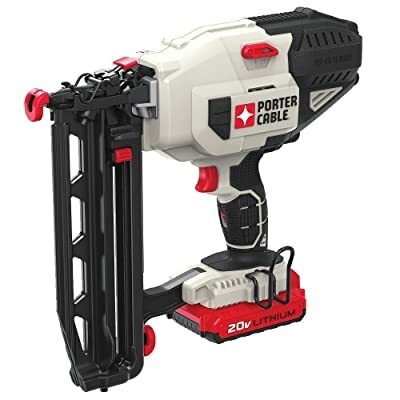 We saw the PORTER-CABLE PCC792LA cordless finish nailer many times on the job sites, it is a preferred nailer of the contractors. We think that this because the PCC792LA is very light and has a much lower price compared to most other cordless models on the market. Unfortunately, we found that this nailer doesn’t work really well on hardwood, but it’s still a great cordless finish nailer for the price. The PORTER-CABLE PCC792LA weighs 6.5 pounds with the battery on it. It has the class’ typical top-heavy, slightly forward-leaning balance. This is a little better with a 4.0 amp hour battery, but don’t expect miracles. We found the handle to be an excellent size and the rubber over mold helped ensure a secure grip. This 16GA Straight Finish Nailer has a fastener length capacity of 1″ to 2-1/2″ and a magazine capacity of 100 nails. When the 20V 4A lithium battery is fully charged, you can expect to sink about 1000 nails – which is a bit higher than what Dewalt’s 20V 2A battery can do. If you use a 4A battery for the Dewalt DCN660, you can sink up to 1500 nails per charge. However, we think 1000 nails per charge is a great number for a cheap cordless finish nailer. Overall, we think this battery-powered finish nailer is a great tool for anyone looking for a good upgrade from the air-powered finish nailer. You can’t find any other cheap model that is better than this one. It’s the best cordless finish nailer for the price. The BOSTITCH BCN650D1 Finish Nailer took a while to come out compared to some of their closest competition and it’s competing for the top spot. For the first time we saw this finish nailer, we were surprised because it looks exactly like the Dewalt. But after we explored it, we found it has been improved a bit and performs better than the Dewalt. That’s probably why it’s more expensive. The BCN650D1 has an extremely lightweight and ergonomic design, it weighed in at 5.8 pounds with the battery installed on our scales. And the nailer seems to be a well-balanced tool that isn’t overly tiring to use, has a good line-of-sight for precise nail placement, offers easy nail loading and quick depth drive adjustment, with the advantage of both single and bump mode firing. Like the Dewalt, this cordless finish nailer comes with a 2A 20V battery. With this battery you can expect to shoot 800 nails per charge. Overall, we can confidently say this is one of the best cordless finish nailers available. But the difference between it and the Dewalt may not seem significant, we think the Dewalt is the better choice for the price. 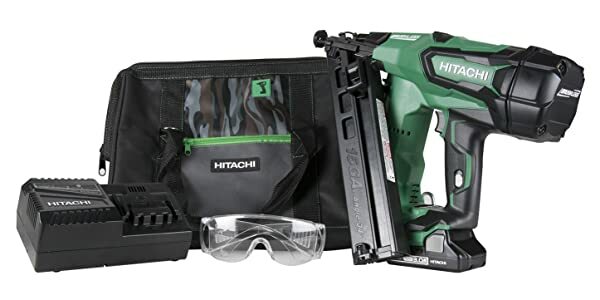 Lifetime warranty and a 3A Lithium-ion battery which is capable of driving up to 1,100 nails per charge, are some of the best features that you’ll get from the Hitachi NT1865DMA Cordless 15 Gauge Angled Finish Nailer. This cordless finish nailer features Hitachi brushless motors that provide longer run time, less maintenance and increased durability. The driving system they employ is similar to Hitachi’s pneumatic line that uses compressed air to drive each nail resulting in zero ramp-up time, increased shooting speed, recoil that feels like a pneumatic nailer, quicker response time between drives, better flush driving-even at an angle, and easy maintenance if the need should arise due to fewer parts to manage. 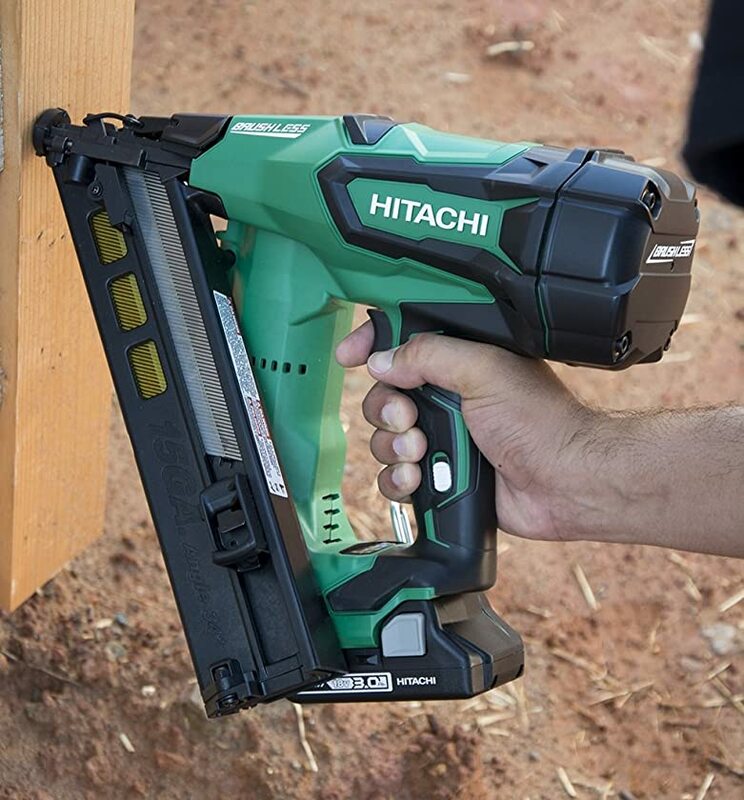 In addition to the advanced brushless motor, like many Hitachi’s cordless power tools, this nailer features a compact 3.0Ah Lithium Ion battery. The battery is equipped with Hitachi’s Multiplex Protection Circuit to prevent overload, over-charge and over-discharge that further extends the lifetime of the battery. You can use this battery for all Hitachi 18-volt lithium-ion slide type tools and conversely. Unfortunately, the Hitachi NT1865DMA cordless finish nailer is relatively heavy compared to other models we reviewed. It weighs up to 7.5 pounds with the battery installed. It’s well-balanced, but it’s not the best cordless finish nailer you want to use day-in and day-out. 5 years ago before Dewalt came out with their own cordless finish nailers, the Senco 5N0001N Fusion Finish Nailer used to be one of the most desirable tools. It was one of the most robust and well-built power tools that we’d ever seen. Nowadays, there are so many great choices for you, we believe this is still a decent option that is worth being considered. 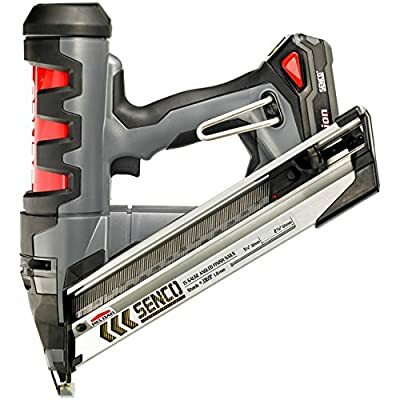 The Senco 5N0001N uses 15 gauge finish nails, which allows it to perform heavy trim work – including setting doors. We found that this nailer works well on hard materials. In our test, it can easily drive 2-1/2″ nails into hardwood, and we got about 450 nails per charge. The battery life was shorter than average but is still a respectable amount. Thankfully, the charger is quick working and got us back on track after only a 20 minute charge time.